This pack was originally going to contain more ships, but I abandoned work when I realized how many Star Wars packs already existed. Higher quality or not, it just seems redundant to do another one since I'm currently working on a Star Trek pack anyways. Anyone truly interested in porting a modernized Star Wars pack should consider 'The Force Unleashed -- Ultimate Sith Edition'. It rips easily, every model is very high poly, has high quality textures (1024x1024 minimum), bumpmaps, and spec masks. 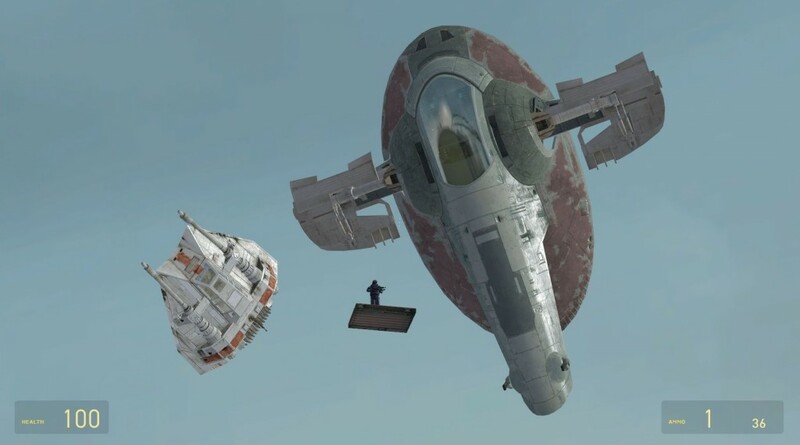 Slave 1 was just background prop if you can believe it, but the devs still put a bridge in it..?? Lucas spared no expense making this game. ApwnInTheDark's Star Wars Pack <-- Addon folder!